These routes also serve the State Fairgrounds and you can use cash, the Metro Transit mobile app or a transit pass to pay your fare. All are wheelchair accessible. Save time and hassle by buying an All-Day Pass on the mobile app or at an A Line ticket machine. For help planning your trip, use the interactive Trip Planner or call 612-373-3333. * Note Nicollet Mall will be closed for Farmers Market on Aug. 23 and 30. On these days, please board buses on Hennepin Ave.
Take the A Line, with rapid bus service on Snelling Avenue between 46th Street Station and Rosedale, right to the fairgrounds. Ride the METRO Green Line between the two downtowns and transfer to the A Line or Route 84 at Snelling Avenue Station. 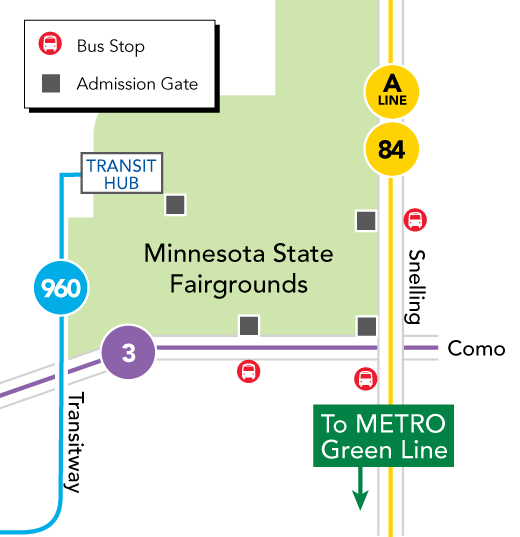 During the fair, northbound buses stop on Snelling Avenue at Midway Parkway; southbound buses stop on Snelling Avenue just past Como Avenue. It’s an easy ride from downtown Minneapolis or downtown St. Paul to a stop at the fairgrounds on Como Ave.